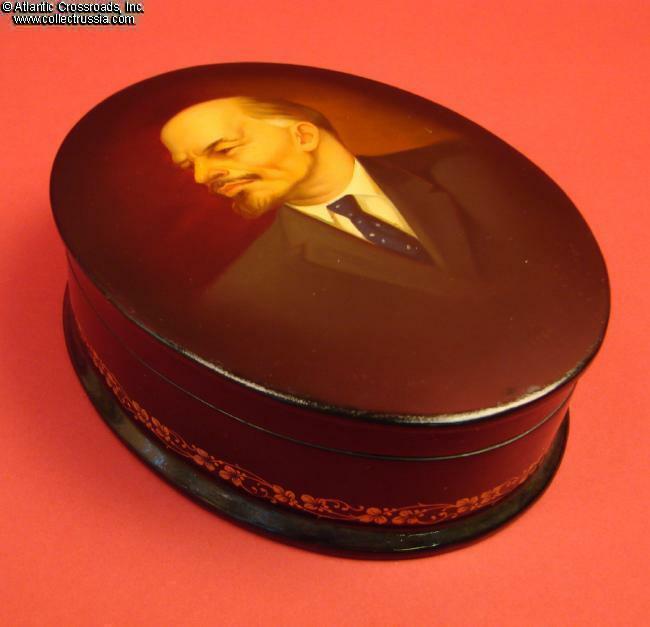 Lenin Fedoskino Lacquer portrait box, by artist Filin, dated 1960. Papier-mache, oil painting; measures 5 ¾" (14.7 cm) x 4 ½" (11.6 cm) x 1 ¾". 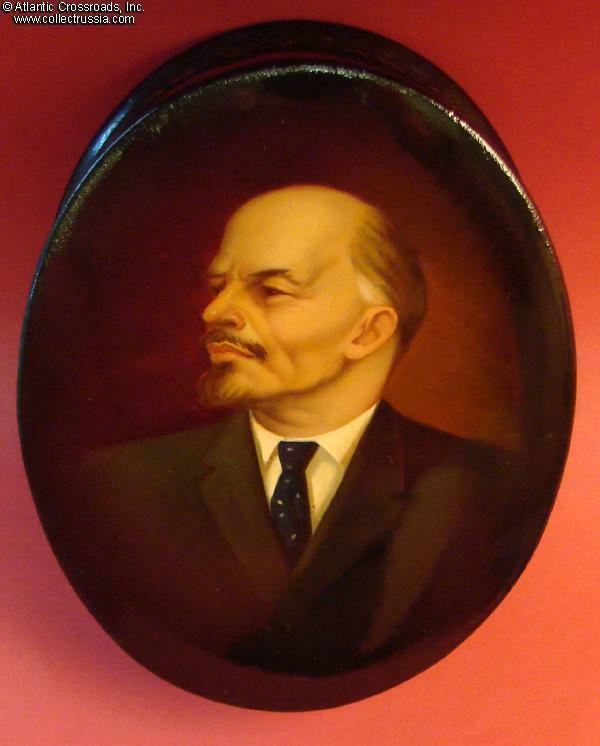 Exceptionally well executed portrait of Lenin is in dark tones appears to draw inspiration from the paintings of Dutch Masters. The artist's signature "Filin" at approximately 4 o'clock position is very subtle - as if careful not to obtrude upon the "sacred" image - but nevertheless clearly legible. The date is at approximately 6 o'clock, written in the same understated fashion and clearly by the same hand. The interior is painted red in traditional manner. 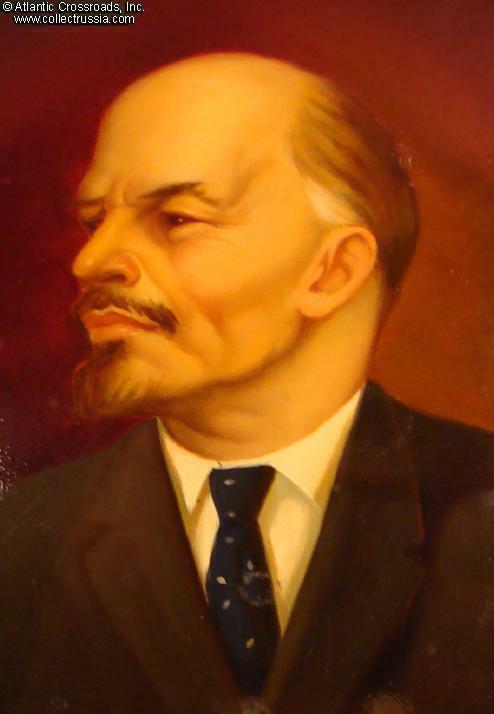 Note that this 1960 portrait is in a way transitional: Lenin has almost the inspired, austere and intense look of the earlier portraits but without as much malice. 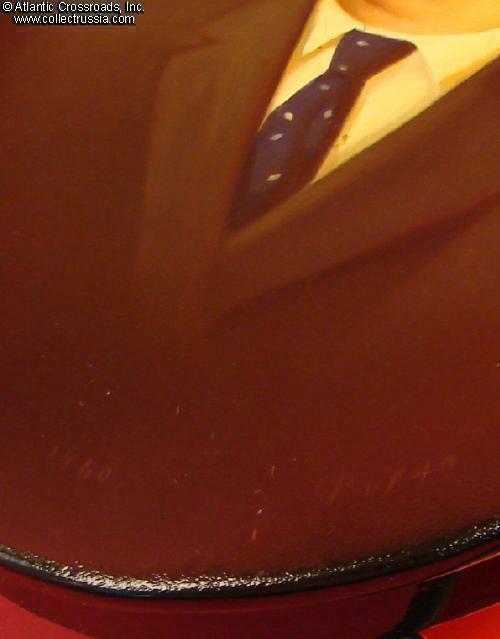 At the same time, he hasn't yet acquired the rounded, more benevolent and "grandfatherly" features characteristics of his portraits from the last two decades leading to the collapse of the Soviet Union. 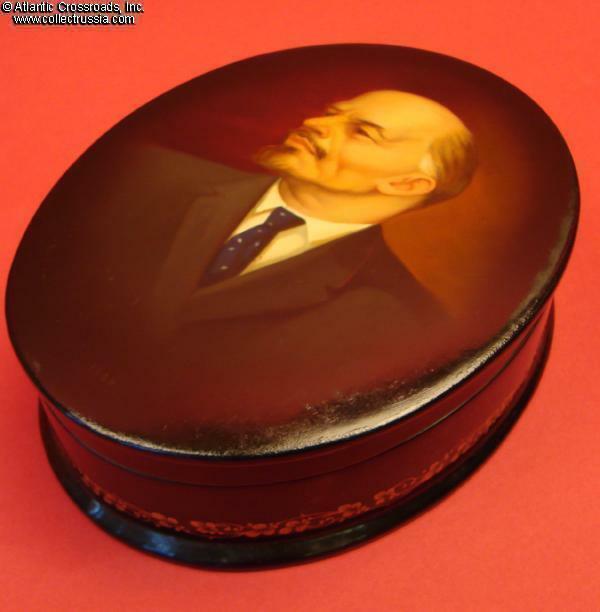 The overall quality of this box is superb, definitely near or at the pinnacle of the best Fedoskino art and simply incomparable with the average boxes with folklore scenes created mainly for Moscow tourist market or export. The box is in outstanding, excellent condition. 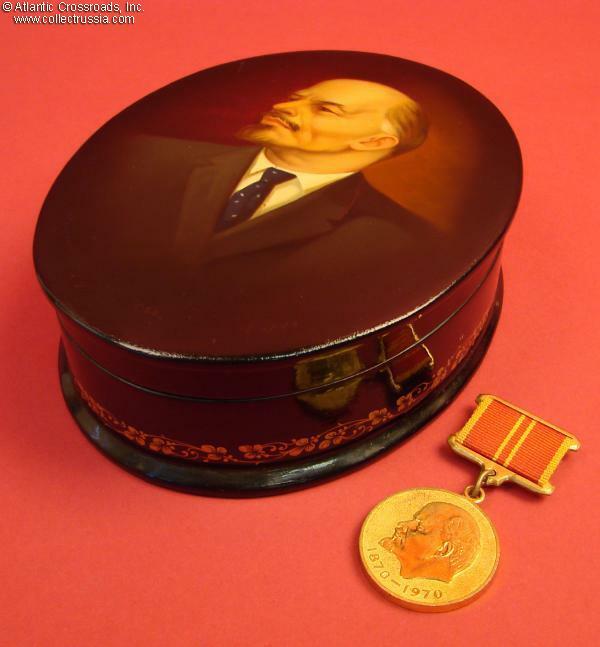 The portrait is nearly pristine; the lacquer is completely free of cracks, discoloration spots or other noticeable wear; retains much of its original luster. 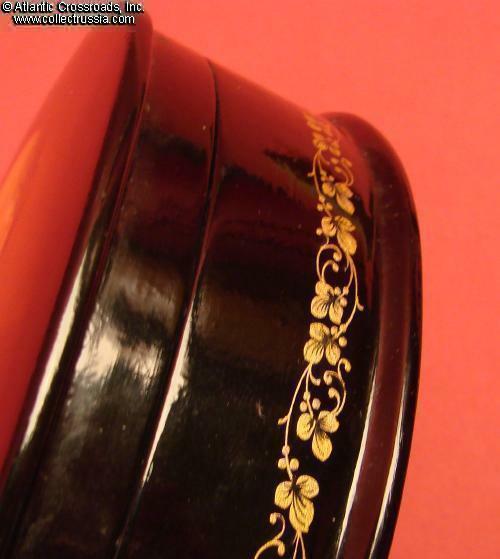 The gold floral ornament on the sides along the bottom is likewise perfectly preserved. 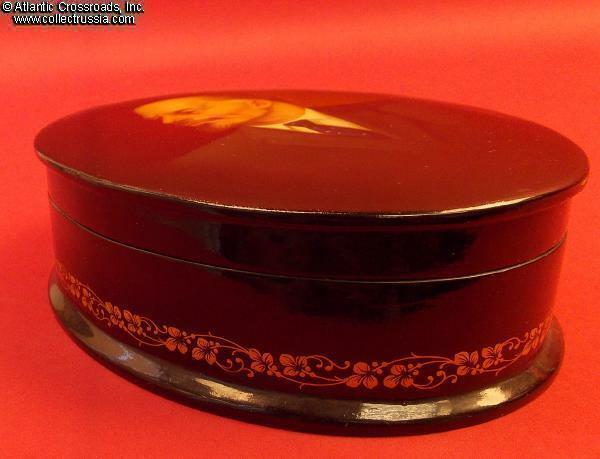 There are only minimal scuffs to the inside at the edge where the lid joined the bottom part of the box, obviously from only gentle occasional use over the years. 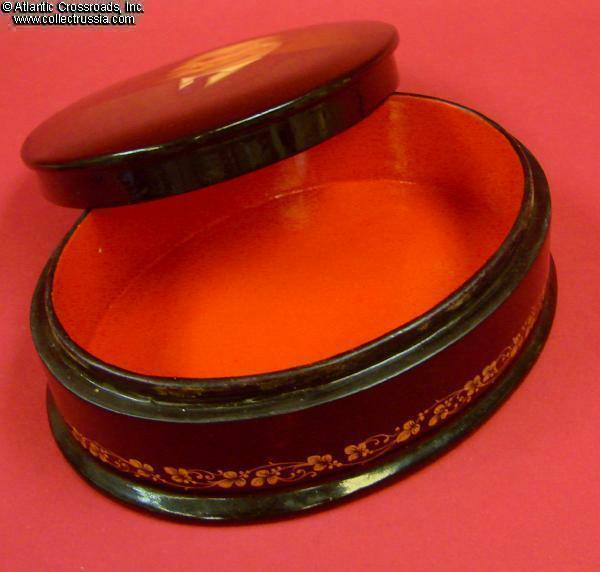 The bottom has light scuffs and minor scratches from normal use. Please note, the medal is for size reference.